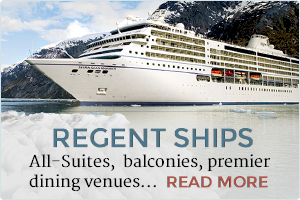 Welcome to Regent Cruise Destinations! Planning the perfect vacation for you and your family takes time, research, and a lot of effort. If things don't turn out just right, you risk your perfect trip turning into a complete disaster. At Regent Cruise Destinations, we ensure that everything about your cruise works seamlessly to create a luxurious experience and lasting memories. As a proud member of the Virtuoso network, Regent Cruise Destinations offers customized, all-inclusive cruises for clients that include premier travel arrangements and luxurious accommodations. If you're interested in a 10 night voyage or a more lengthy 20 or even 50 night adventure, a Regent Seven Seas Cruise can take you anywhere in the world. Our incredible cruise packages include such destinations as: Alaska, Africa, the British Isles, the Caribbean, Greece and the Greek Isles, South America, South East Asia, the Mediterranean ...and many other beautiful, exotic locations. Traveling to more than 330 ports around the world, you'll be able see and experience firsthand some of the most incredible locations without having to unpack and repack your luggage, take multiple flights, or catch a train. Just one all-inclusive cruise can take you to the furthest parts of the globe and back home again while you rest and relax in absolute, all-inclusive comfort. 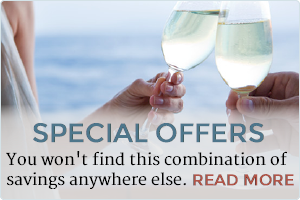 Regent Seven Seas Cruises are able to provide you with a singular experience that can't be replicated anywhere else. Enter a world of luxury by enrolling in Virtuoso Voyages. Only Virtuoso Voyages members have access to exclusive value-added experiences - shore events, private car and driver and more! Chose from any one of our incredible luxury cruises and you'll automatically become a member of this prestigious club and experience all of the benefits. Before you spend hours and hours of your precious time online, contact Regent Cruise Destinations and let us work with you to plan the perfect Regent Seven Seas Cruise vacation!